There are quite a few side effects of Strivectin SD that consumers should be aware of prior to purchasing the popular stretch mark and anti-wrinkle age treatment. Strivectin-SD is a multi action skin perfector which has quickly become touted as "better than Botox." Although Strivectin SD is a skincare treatment that was initially marketed for topical use on stretch marks, the ingredients in the product quickly became likened to treating wrinkles and diminishing the appearance of fine lines. There are differing opinions on whether or not Strivectin works, but when on the pursuit for perfection, consumers may find this cream worth a try. If you're new to the anti-aging skin care market, be prepared for your fair share of disappointment. Although science and advanced technology have helped formulate remarkable products that produce visible results, not all skin care treatments deliver on their promises. Aging skin is inevitable, so be realistic with your expectations. Products are marketed to treat the skin when the damage is done, when in reality, ingredients most often aide only in prevention. Once skin changes have become permanent, options are very limited. Strivectin-SD is enriched with Striadil. Striadil is less likely to cause irritation and is considered safer and more effective than other leading anti-wrinkle creams. 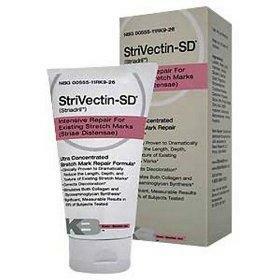 As with any topical cream or skincare treatment, there are possible side effects of Strivectin-SD. Keep in mind results and side effects will vary per individual. Headache: Mild-natured headaches have been reported with the use of Strivectin. If headaches persist or worsen, seek counsel. Redness: Spots of redness in the area of application are common in those that experience a mild reaction to the treatment. Eyelid dropping: Although this side effect is generally temporary, it can worsen to a severe state. Borders of the upper eyelid can begin to drop, and may even progress to impaired vision. Nausea: Although rare, some patients may experience nausea when using Strivectin SD. It's always wise to consider the side effects of any drug. In some cases, side effects can produce decreased levels of comfort. There are many suitable alternatives to Strivectin that can treat conditions such as aging or stretch marks without the same unfavorable side effects. If you've experienced side effects from Strivectin and wish to discontinue use, rest assured there are plenty of reputable replacements and alternative forms of treatment, whether that be another skin care cream or cosmetic procedures such as Botox. A dermatologist can assess your needs and determine a product worthy of a splurge and guide you towards an effective treatment and prevention plan. Because skin care products are a costly investment, it's worth it to try free, sample size products whenever possible.